My Cousin Nina sent me a link to this nice New York Times recipe for mashed potatoes a few years ago, the first time I did any serious cooking for Thanksgiving dinner. 2. In a saucepan or a microwave oven, heat butter and milk together until butter melts and mixture steams. Drain potatoes well and return to pot. 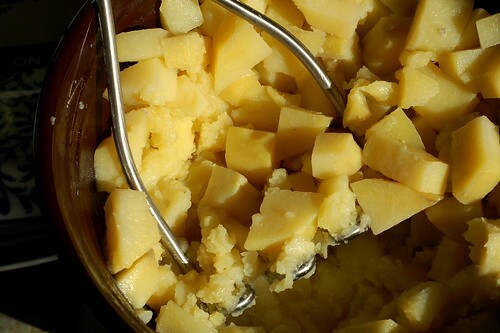 Using an extruding masher or a ricer, mash hot potatoes until smooth. Lightly mix in about half of hot butter mixture, just until blended. Taste for salt and add more butter mixture until seasoned to your liking. 3. Stop here for fluffy potatoes. 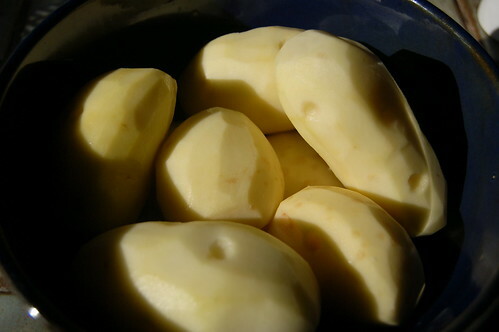 For creamy potatoes, keep stirring potato mixture, using a sturdy spoon to press it against sides and bottom of pot. Mix until dense and thick. For whipped potatoes, use a stand mixer to mash hot potatoes just until smooth, about 30 seconds. Add all the butter mixture and salt to taste, pulsing machine in short bursts at medium speed. When light and creamy, stop mixing immediately (potatoes can quickly become sticky). 4. To keep hot until ready to serve, transfer to serving bowl, dot top with butter, cover tightly and keep in a warm place, like the back of the stove. Potatoes will stay hot for at least 30 minutes. To keep longer, place covered bowl in a pan holding about an inch of gently simmering water. Before serving, mix well. Can you please cut this recipe down for one person? Or just email it to me? elizmcmahon@yahoo.com. Thanks.